Welcome to Kloof View B&B! from R 840 per person, per night. Conveniently situated just a stone’s throw from the centre of Kloof, Kloof View Bed and Breakfast has two well-appointed en-suite rooms waiting to welcome you. In the morning enjoy your breakfast outside on the deck taking in the view across Kloof or in our large breakfast room looking out at the pool. Kloof View Bed and Breakfast is a family run B&B within easy walking distance to Stokers Pub and the shops and other restaurants in the centre of Kloof. If you are visiting on business travel we are only 25 minutes from Durban or Hammersdale and 10 minutes from the busy business centres of Hillcrest or Pinetown. Gourmet breakfasts of your choice from fruit platters to continental or full English breakfasts available. Secure onsite parking available with independent access to each of the rooms. Our great location means that the beaches of Durban and Umhlanga as well as the Midlands are within easy driving distance. If you are looking for secured privacy with good access to the M13, N3 then Kloof View B&B is for you. If you are lucky enough to be on holiday sit on the deck to bird watch in our large garden with a host of indigenous plants, shrubs and trees (and of course enjoy the occasional visit from monkeys) or swim in the pool. Choose the style of room you would like. I stayed here for three nights and it was a lovely experience. The views were magnificent, and the folks who run it (Lydie and Ian) were so accommodating. Make sure you take the time to enjoy breakfast in the beautiful breakfast room - no better way to start your day! Had an wonderful time at Kloof View B&B. Such a lovely people. What a great place, they treated me as I was their own family. Great views, awesome breakfast, wish I could have stayed for two weeks. 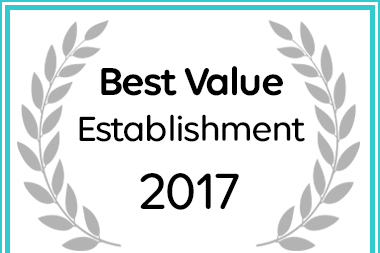 Kloof View Bed and Breakfast in Durban has been named a Best Value Establishment.